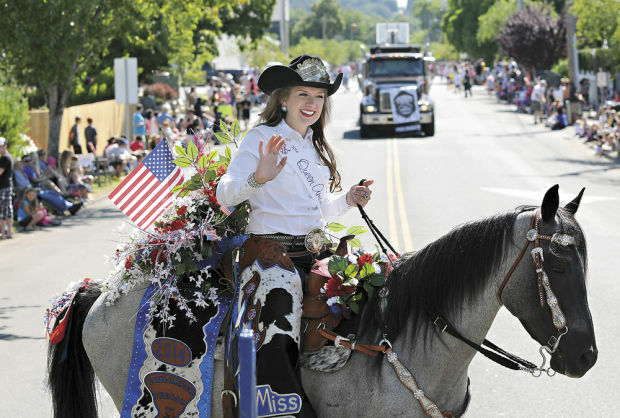 Philomath Frolic & Rodeo invites you to be part of the Grand Parade! Come participate in the combined Kids Parade and Grand Parade and help celebrate the Frolic & Rodeo. Fees: $10 per entry, includes 1 vehicle. There is an additional fee of $5 for each additional vehicle in an entry. You may register the morning of the parade (except for horses) but will be placed at the end of the parade line-up. Parade Day Registration and check-in: begins at 7:00 AM at the entry to Philomath Middle School (enter off of Chapel Drive). Judging begins promptly at 9:00 AM. Pre-registration is required prior to parade day. Horse entries will not be accepted the day of the parade. Check in is at the registration table located at entry of Philomath Middle School (enter off Chapel Drive). Judging begins at 9:30 AM for horse entries. Horse entries will be judged in the east parking lot of the middle school, and then proceed to their place in the parade at 9:45 a.m. Please keep off the grass. Adult must accompany all persons under the age of 9 at all times. All tack must be clean, in good repair and fit properly. Horses must be kept under control at all times, or you will be asked to leave the parade. Proof of Insurance must be submitted with Entry and Liability Release Form to the Parade Chair before Saturday morning. Insurance must include bodily injury and property liability with combined single limit of $1,000,000 (one million) dollars. CANDY RULE: YOU CANNOT THROW CANDY FROM A VEHICLE! YOU MUSTS HAVE WALKERS HANDING OUT ANY CANDY, FLYERS OR STUFF. PLEASE KEEP ALL ITEMS OUT OF THE STREET WHERE KIDS MIGHT RUN IN FRONT OF A VEHICLE TO GET IT. Enter into Philomath Middle School from Chapel Dr. Check in at the Registration Table.Proceed to designated line up position. Staging will be from the Middle School through the bus lane to Applegate (through the High School parking lot). The Parade will leave the Philomath High School parking lot and head west (left) on Applegate Street to 11th Street, left onto 11th Street, then left into the Rodeo Grounds to disband. Please do not disband or drop off riders until you have entered the rodeo grounds parking area. Judging for the Grand Parade begins at 9 AM (except horse entries). Please be in place and ready by then. Horse entries are judged 9:30 AM, before they enter the line up at 9:45. There will be 4 overall trophies awarded, as well as ribbons for Category Awards. The Kids Parade leads the Grand Parade and all kids are invited to take part! The kids will gather in the Philomath High School west parking lot around signs indicating the category they wish to be judged in. Please be in place before judging which begins at 9:30 sharp! Judging categories include: Best Use of Theme, Wheels (Bikes, Trikes, wagons..), Kids with Pets, Small Groups (<10 kids), Large Groups (10+ kids), Junior costume (5 yrs or younger), Senior Costume (6 yrs+). Disband area is the Rodeo Grounds parking area. Parking is available at Clemens Primary School off of 19th Street, you will not be able to drive to the Middle or High School from there. The Parade line up route is one way from 7am on (enter from Chapel Drive), and is closed to non entered vehicles after 9 AM.